Retirement- What Will You Do ? There are many questions to ask in planning ones retirement. Location seems to be one that consumes much of the press including sun, surf, sand, weather and cost of living. The question that we always suggest clients ask themselves before relocating and retiring is “consider what you want to do in your retirement?” The above factors are definitely part of the equation, however there is more. The happily retired people we see in Ajijic are actively engaged in sports, hobbies and organizations that they may not have had time for in the past, or have done and now have more time. The nearby availability of these activities is so important to ones quality of life. In all our travels and places that we have lived, Ajijic has a most interesting and wonderful asset. It is called the Lake Chapala Society (LCS). 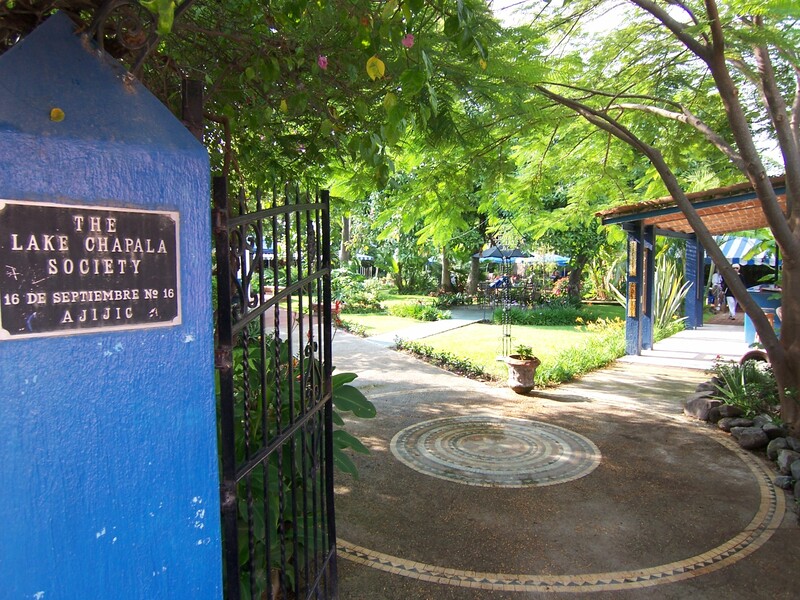 It is situated on a 2 acre property in downtown Ajijic ; was donated to the Society by a benevolent lady – Neill James. Founded more than 50 years ago by about 30 English-speaking residents as a cultural, social and benevolent society, today’s membership (mostly expats.) surpasses 3700; an impressively large number for a small Lakeside Village area. Its goal- since its founding: “People Helping People” Neill James (1885-1994) had a passion for travel and for helping people and children. Today, the LCS, is an active meeting place, 6 days a week, from 10am until 2pm.with 50 plus clubs, 250 or more volunteers and many budding young Mexican Artists and wood workers. Associated clubs include, Camera, Digital Camera, Computer, Discussion Groups, LCS Garden Club, etc. Health Care volunteers offer free checking of; blood pressure, skin cancer, eye exams, hearing checks and more. Other Associations visit on a weekly or bi-weekly basis to answer questions on Health Care, Insurance etc. Health Care Weeks are popular. Exercise: there is Yoga, Line Dancing and morning exercises. Spanish classes : Four, free, excellent, beginner classes are offered with advanced classes also available. Art classes and wood working is given to eager Mexican children as well as 24 English classes at the associated Wilkes Education Center, plus 3 in computers and one in nutrition to over 200 students. Talented (mostly retired), expats organize and run these and other programs. One of the draws to the LCS is its English Book Library (apparently) the largest non Government , non Institutional English Library in the Spanish world, (about 25,000 volumes). Nearby is a Video-DVD (Tape Worm) library with a great selection of Movies and a Talking Books service through the US Library of Congress. The grounds are beautifully planned, manicured, and plants labeled, by both volunteers and staff, with fountains, fish ponds, Gazebos, and areas for relaxing and reading. The coffee-snack area is a very popular, friendly, casual meeting place as is the Ticket area, that offers tickets to a myriad of events throughout the year. for a web album that will give you an overview of some of the many activities and joy that abounds from Ajijic’s Lake Chapala Society. So – besides all the other activities in Ajijic, such as golf, tennis, bridge, gardening and gourmet clubs, live theatre, singing and dancing etc., plus those that are available in a nearby major city- Colonial Guadalajara, the Lake Chapala Society is a terrific, “One of a Kind” extraordinary asset to the community, enhancing the quality of so many lives. There is definitely- lots to do for anyone- retired or not, and the LCS is a great place to start. Your next step- visit Ajijic -check out the LCS and the many other attractions of Ajijic, Chapala and Guadalajara.